Although he wouldn’t become a vegetarian until age 13, Paul Shapiro loved animals at least several years before that, penning a short story at age 9 about a lost dalmatian titled Where’s Spot? Now serving as Vice President of Policy Engagement for the Humane Society of the United States, Shapiro’s first book comes out this week: January 2, 2018. It’s titled Clean Meat: How Growing Meat Without Animals Will Revolutionize Dinner and the World, about new technology that allows meat to be grown in a lab by multiplying only a few cells of an animal — without any slaughter or death involved. Shapiro predicts the practice could become the industry standard at your local supermarket and restaurant within a few decades. My thoughts on Where’s Spot? I’m not sure what the pub date on this literary masterpiece is, but my mom thinks I was perhaps nine when I penned it, meaning around 1986. Interestingly, it’s actually not penned at all, but rather typed, meaning I was a nerd with some type of primitive word processor of the day. It appears that I forgot to type the title and byline, meaning I had to scrawl them onto the page post-printing in cursive, which at least is far better than my cursive today. It doesn’t get much better from there. Exhibit A: “Spot was a Dalmation with many spots.” Even ignoring my misspelling of Dalmatian, I wasn’t exactly painting the most vivid picture for the reader. I don’t want to give away the ending of the gripping mystery, but it’s not much of a page-turner. Well, it’s literally not much of a page turner in that it’s just barely more than one page. But if you can’t make it all the way to the end, at least rest easy knowing that the question in the title of the novella is indeed answered. Spot is found. For what it’s worth, given that I now work full-time in the animal welfare field, it does seem at least somewhat interesting that even at such a young age I was writing a story involving a missing animal in need of help from the local animal shelter. Perhaps if my parents had known this would be my career they could’ve saved a lot of money on education in topics unrelated to my profession. For one, writing lessons would’ve been useful. Here’s the original short story alongside a transcribed text — spelling and punctuation errors intact. It was a Sunday morning at the Simpson’s [sic]. Scott was playing with Spot, the family dog. Spot was a Dalmation [sic] with many spots. Spot was in the right neighborhood at the right time.. He had all the best dog friends in the world. There was Bess, Ron, and Blinky. One day all the dogs were out playing together. Spot saw a huge pile of soot and decided to jump in and so did the others. They played in the soot for hours. In fact Spot was so black that you couldn’t reconize [sic] him. Mr. and Mrs. Simpson called everyone about Spot to ask them if they’d seen him. Bess, Ron, and Blinky were reconized [sic] by their owners immediately. After Mr. and Mrs. Simpson got back from the animal shelter they asked Scott if anyone called. Scott replied like this: Nobody called but a black dog stopped by and tried to get into Spot’s bed but I made him leave because I knew we couldn’t get a new dog. Mr. and Mrs. Simpson ran over to Spot’s bed and saw that it was full of soot. Immediately they realized that Spot must have come home full of soot and not have been recognized [correct spelling that time] by Scott. by strangers. The third dog, however, didn’t mind at all. In fact, he licked the Simpsons, who were not surprised after that to discover that the black dog was really Spot. Not many people have interviewed both President Barack Obama and Kim Kardashian. But most people aren’t Kara Swisher, executive editor of Re/code, the huge website covering all things tech. A profile article called Swisher “Silicon Valley’s most feared and well-liked journalist,” with 1.2 million Twitter followers. Swisher enrolled at Georgetown University in fall 1980, hoping to work for the CIA. She hadn’t even written for her high school newspaper in Princeton, New Jersey, instead only serving as an editor for the yearbook. Yet she started writing for the Georgetown Hoya, winning a journalism award her freshman year which was usually intended for seniors. Here is what I recall: Absolutely nothing about writing this piece. I have written so many articles over the years, I am afraid that it is impossible to recall any of these. In fact, it speaks to the change in journalism — it is such a fast-paced media world now that we are subject to a news cycle that is both immediate and incomprehensible at times. As you might imagine, this is both good and bad. The Chesapeake and Potomac Telephone Compnay [sic], the utility that services all public and private phones on the Georgetown campus, says it will attempt to “crack down” on fraudulent calls from campus areas, particularly zeroing in on the fraudulent use of public pay phones. The means with which C&P will attempt to thwart the frauds are varied. According to Coale, the local phone affiliate is as advanced electronically as any section of the nationwide Bell System. Ultra-sophisticated equipment in conjunction with the operator will alert the phone company to “suspicious calls,” and the culprit will now be dealing with machines rather than just human beings. New procedures in verification on credit card calls and third party billing will be utilized with operators and computers checking pay phone calls more often, rather than the “on the spot” methods being used right now. The phone company will also be arresting and subjecting the offender to civil and criminal penalties. C&P maintains that telephone frauders leave clear trails, such as the number called. The company claimed that it will even go as far as coming right to the phone to catch the offender in the act. A number of students from surrounding universities have been apprehended in this manner. The Bell System’s attitude towards this situation is reflected in Coale’s comments. “Unfortunately,” Coale said, “we can no longer afford the luxury of letting college students off with just a warning. If the matter continues even after these methods, we have no other choice but to discontinue use of the pay phones. We have done this on other college campuses for three to four weeks, and have found that students understand the real advantage of a pay phone system. Thanks to Georgetown University Archivist Lynn Conway for locating this article deep in the archives. 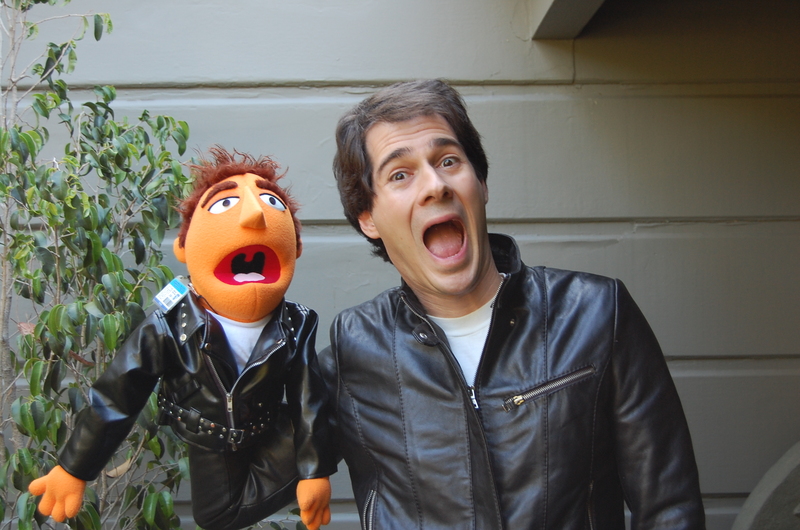 Follow Swisher on Twitter @KaraSwisher where she has 1.2 million followers and counting. Visit her Re/code author page here where you can read all her articles and listen to episodes of her podcast Recode Decode. John Harris, Politico editor-in-chief. Photo source: Politico. Decades before he ran one of America’s top political journalism newspapers and websites, John Harris wrote a political article for his Minnesota college newspaper in which he interviewed an alum who became one of the key figures in the Vietnam War. Everybody should read Harris’s September article “Why Journalism” about why he believes the field is still bright and its best days are ahead, even as the press these days is so often attacked, maligned, and distrusted. Also check out Harris’s interview last week with Florida Gov. Rick Scott, the governor of America’s largest swing state. On a personal note, I’d also like to express gratitude to Mr. Harris for taking the time to speak with me one-on-one for a solid half hour during my 2015 Politico internship. At many institutions, those atop of the hierarchy won’t even make eye contact with those at the bottom. Harris’s Politico author page with all his articles is here, and you can follow him on Twitter @HarrisPolitico here. Here, Harris explains the backstory behind his March 1982 college newspaper article titled “Melvin Laird’s best defense.” The article itself is at the bottom. I remember vividly the reporting circumstances around this piece—written 33 years ago, during my junior year in college—but definitely did not remember much about the actual text of the story. I was that year editor of the Carletonian, the campus newspaper at Carleton College. 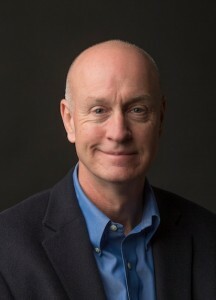 I was always interested in politics—an interest that preceded my interest in journalism—so it was natural that I agitated to publish pieces that could connect the campus in Northfield, Minnesota with people who had done interesting things in Washington or other parts of the political world. At that time, only a decade past the traumas of the Vietnam War and Watergate, Melvin Laird was still a well-known figure. (He died last year at age 94). He was a Carleton alumnus from 1944 who had gone on to be a well-regarded GOP congressman from Wisconsin and, more controversially, President Nixon’s Secretary of Defense during the closing years of Vietnam. Importantly, from a Carleton perspective, he had gone from being a loyal alum to someone who was rather aggrieved with the institution. He felt he had been ostracized and even smeared by student activists and some faculty during Vietnam, and the college leadership had not done enough to stand up for him personally or the cause of open debate generally. Specifically, he believed that an offer to come explain himself and administration policy on campus had been rudely snubbed. That assertion was disputed by some, but he was clearly sincere in his belief that it happened. So, the interview in his Washington office started out a bit warily—he seemed to be sizing me up to see whether I had some axe to grind. I didn’t. Though the events were actually fairly recent—closer in time than, say, 9/11 is us to now—to a 20-year-old they seemed like a distant era. Laird was very close to many reporters, so I think once he decided I wasn’t baring fangs he got kind of a kick out of talking with me. I’m sure if a transcript existed it would show him running circles around me and my questions. On to the writing… What I worried about when I went to read the piece turned out to be true. It strikes me as clumsy and pretentious. In fairness to myself, pretentious isn’t the worst thing you can say about a young writer. Probably most ambitious journalists start out as pretentious: We see work we admire and so we think to ourselves, “I want to try that.” We are not aware at the time how painfully obvious that trying and pretending is, at least to observant readers. In this case, even the conception of the piece was derivative. I had read a piece in the New York Times Magazine by Fox Butterfield about how as the Vietnam War receded in time and emotions on campuses cooled there was a reappraisal taking place in the academy: People were more willing to examine the Vietnam debate from multiple perspectives, including that of U.S. policymakers, and less prone to view it simply in good vs. evil terms. By trying to present the Laird story in that context—wanting to seem like I was deeply exploring an important intellectual movement—I let the story get muddied. The essence of the article should have been much more straightforward: What actually happened between Carleton and Laird in the late ‘60s and early ‘70s, and what did he and other relevant characters have to say now? This essence is lost in florid language and murky presentation. Oh, well. Even as I cringe a little upon reading the story I’m certainly not embarrassed by it. I remember getting some praise from people who thought it was interesting. I think tackling the subject matter and trying to present it in a sophisticated way showed ambition, which is what I admire and look for now in young journalists. So I suppose I’ll give myself a B+ for the piece, and hope I am not accused of grade inflation. But Annie didn’t always write with such a happy tone. In sixth grade, she won a poetry contest with much more sinister and morbid language. First here’s her explanation of the context and backstory, followed by the text of the poem pasted at bottom. Won the Suffolk County poetry contest in 1974. Typed it from memory since I had to memorize it way back when at the awards ceremony! I was so scared it stuck! Wolves is the title. The contest wasn’t just for kids, it was for all Suffolk County, NY (on eastern Long Island.) I remember the second place winner was a teacher. The tone of the poem is definitely dark. I was very serious back then about animal welfare (wanted to be a vet.) I didn’t really discover my funny side until I started to write plays and perform in musical comedy. I have a dark side still (don’t we all?) but I feel comedy is more effective a tool for teaching kids on TV. I just finished a play — a comedy about infertility. So it has a dark edge to it, but my point is to make it funny, since life is. If you aren’t laughing right now at the state of things, you’re weeping. Slipping through a moonless night. Stalking up to a silent prey. Squatting down to make that deadly bite. A wolf makes its last and final kill. A fluttering noise shatters the silence. Fright is passed through the woods. Bullets shoot through the air with great violence. And in the end a wolf lay dead in the snow. Man just taking a life like this? So another legend is confirmed. The tale of Mamie Lang Kirkland, the elderly black woman who finally returned to her home state a full century after her family left while fleeing a lynch mob. The sad life of Jesse Webster, who since 1996 has served life in prison without parole for a completely nonviolent offense. His column last October covering a Chicago Cubs vs. New York Mets baseball game as though it was 1908, featuring old-fashioned terminology (a single becomes a “one-bagger” and the Mets become “the Metropolitans”), a century-old font in the newspaper print edition, and grainy black-and-white photographs. Another baseball-related story, his book “Bottom of the 33rd” about the longest baseball game of all time in 1981. Barry alternates chapters describing the game inning-by-inning and tracking down the (often tragic) lives of the minor-league players in the subsequent three decades. I read the whole thing, all 33 innings of it, and I’d highly recommend even if you don’t love baseball. As proof, I don’t love baseball! Barry’s new book, released just last month, is “The Boys in the Bunkhouse: Servitude and Salvation in the Heartland,” the true story of several dozen intellectually disabled men who were kept in servitude for more than 30 years in a small Iowa town without anybody knowing before gaining their freedom. Check out Dan Barry at his official website DanBarryOnline.com, follow him on Twitter at @DanBarryNYT, on Facebook at DanBarry.Author. The story of Tony Oni — whose real name was Tony Villani — had a deep impact on me. I was a student at St. Bonaventure University, trying to imagine a life as a journalist who told the stories of others, including the vulnerable. And here, every morning, came Tony to my dormitory to pick up the beer cups and other debris of a bunch of relatively privileged young men from Syracuse and Buffalo and Long Island. Some ridiculed him for his intellectual disability, even as he cleaned their mess. To check out the rumor that he was Sophia Loren’s cousin, I visited Tony in his squalid apartment in a dodgy part of town. He said he had a photo; it turned out to be a movie poster on his wall. But I kept digging, and ultimately found a photo of the two of them in an old campus newspaper. I’m indebted to Tony Villani. I learned about the chasm that existed between the non-disabled and disabled worlds — that still exists, as I recently discovered in researching and writing “The Boys in the Bunkhouse.” I learned about not giving up in digging for facts. And I learned the rush from snatching a true story from out of the clouds of myth and rumor. As the upperclassmen arrive a few days later, they fill the freshman in on the history of his new home. Yes, Lanier lived here, and there’s where the Great Water War of ‘76 took place, and up on Fifth Dev two guys said a black mass and a priest held an exorcism. But the only story that the upperclassmen tell with a special tone of reverence and mystery is the one about Toni-Oni, the janitor. He’s Sophia Loren’s cousin, the upperclassmen say. Some people say his name is Antonio Villani and he lives across from Burger King in town. Others who know better say his name is Toni-Oni and he lives in Devereux tradition. After all, the upperclassmen say, he’s Sophia Loren’s cousin. Time Magazine humor columnist Joel Stein, present day and with his mullet in 1990. Not sure which one is Joel Stein. That’s what you’ll read in the back pages of Time Magazine which feature the weekly irreverent humor column “The Awesome Column,” written since 1998 by comedy writer Joel Stein. It sucked. I was copying Dave Barry. I was the only person where they made me submit a second sample because that one was so weak, but someone thought there was something there. 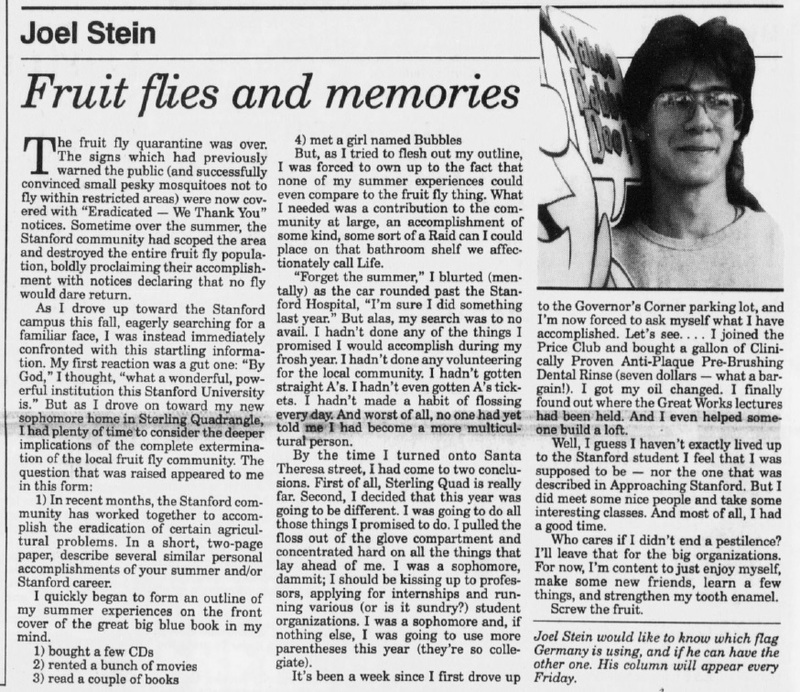 Here’s his original October 5, 1990 humor column “Fruit flies and memories.” Hopefully you can get past the late-’80s style mullet haircut in his author photo. Click on the image or open it in a new tab to enlarge. The fruit fly quarantine was over. The signs which had previously warned the public (and successfully convinced small pesky mosquitoes not to fly within restricted areas) were now covered with “Eradicated — We Thank You” notices. Sometime over the summer, the Stanford community had scoped the area and destroyed the entire fruit fly population, boldly proclaiming their accomplishment with notices declaring that no fly would dare return. In recent months, the Stanford community has worked together to accomplish the eradication of certain agricultural problems. In a short, two-page paper, describe several similar personal accomplishments of your summer and/or Stanford career. I quickly began to form an outline of my summer experiences on the front cover of the great big blue book in my mind. But, as I tried to flesh out my outline, I was forced to own up to the fact that none of my summer experiences could even compare to the fruit fly thing. What I needed was a contribution to the community at large, an accomplishment of some kind, some sort of a Raid can I could place on that bathroom shelf we affectionately call Life. “Forget the summer,” I blurted (mentally) as the car rounded past the Stanford Hospital, “I’m sure I did something last year.” But alas, my search was to no avail. I hadn’t done any of the things I promised I would accomplish during my frosh year. I hadn’t done any volunteering for the local community. I hadn’t gotten straight A’s. I hadn’t even gotten A’s tickets. I hadn’t made a habit of flossing everyday. And worst of all, no one had yet told me I had become a more multicultural person. By the time I turned onto Santa Theresa Street, I had come to two conclusions. First of all, Sterling Quad is really far. Second, I decided that this year was going to be different. I was going to do all those things I promised to do. I pulled the floss out of the glove compartment and concentrated hard on all the things that lay ahead of me. I was a sophomore, dammit; I should be kissing up to professors, applying for internships and running various (or is it sundry?) student organizations. I was a sophomore and, if nothing else, I was going to use more parentheses this year (they’re so collegiate). It’s been a week since I first drove up to the Governor’s Corner parking lot, and I’m now forced to ask myself what I have accomplished. Let’s see…. I joined the Price Club and bought a gallon of Clinically Proven Anti-Plaque Pre-Brushing Dental Rinse (seven dollars — what a bargain!). I got my oil changed. I finally found out where the GreatWorks lectures had been held. And I even helped someone build a loft. Well, I guess I haven’t exactly lived up to the Stanford student I feel that I was supposed to be — nor the one that was described in Approaching Stanford. But I did meet some nice people and take some interesting classes. And most of all, I had a good time. Who cares if I didn’t end a pestilence? I’ll leave that for the big organizations. For now, I’m content to just enjoy myself, make some new friends, learn a few things, and strengthen my tooth enamel. Screw the fruit. Joel Stein would like to know which flag Germany is using, and if he can have the other one. His column will appear every Friday.